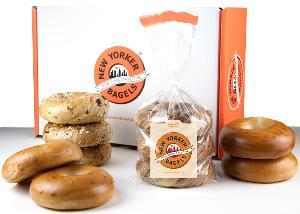 Contest: WIN: a year of hand-rolled NYC Bagels from New Yorker Bagels! WIN: a year of hand-rolled NYC Bagels from New Yorker Bagels! Prize: 36 Fresh-baked, hand-rolled bagels per month for a period of 11 months. Bagels will be shipped monthly at sponsor's expense via overnight shipping.